Blue Howlite and Stainless Steel Collar Necklace, "Afternoon Sky's Magnitude"
This necklace wraps up the beautiful blue of an afternoon sky for you to wear. 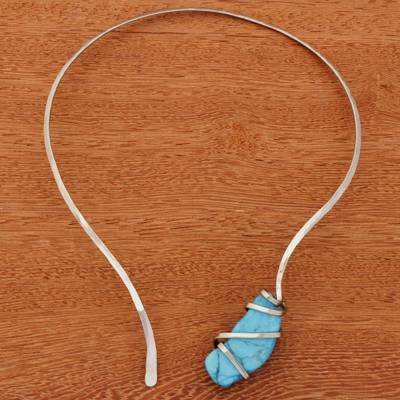 Artisan Bruno Walter of Brazil hand crafts this collar necklace out of a ribbon of stainless steel that arcs around the neck and then cradles a freeform nugget of blue howlite. You can find howlite collar necklace 'Afternoon Sky's Magnitude' by Bruno Walter in jewelry categories such as Modern Necklaces, Howlite Necklaces, Stainless Steel Necklaces, Collar Necklaces and Pendant Necklaces. Enjoy exploring these sections for other Novica treasures.